Libras are the diplomats of the zodiac. They are charming, easy going, tolerant, and willing to suppress their own needs and opinions to preserve good relations. Typical Libras avoid conflict at all costs, and they would rather give in than have an unnecessary argument (or in some cases, a necessary one). Libras have a strong need to be liked by others and will often suppress or hide their own feelings to achieve this. Some will even lie to keep the peace, as they hate emotional drama. Arguments make Libras miserable. They crave peace and much of their lives are spent in the pursuit of harmony and idealized relationships. 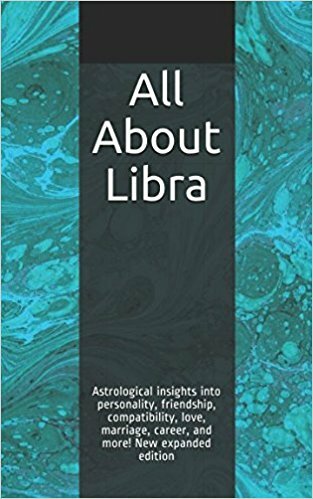 Libras need a lot of intellectual stimulation, so they tend to do a lot of reading and spend plenty of time discussing issues with others (many are particularly interested in politics). Libras tend to process things logically rather than emotionally (the exception to this rule is a Libra with a water rising or moon sign). This emotional detachment enables them to make calm, unbiased assessments of situations and people. Libras usually have no problem making friends because they have good social skills and tend to be laid back and friendly. They are usually flirtatious, typically charming, and often good-looking, so there is no shortage of potential partners for them. Moreover, their charisma and tendency to flatter others ensure that many people seek out their company. Most Libras have a strong romantic streak that overwhelms their intellect in relationships. Sometimes they fall in love more with the idea of being in love than with their actual partners, and they have a tendency to put their partners on pedestals from which they inevitably fall. As a result, Libras are frequently disillusioned. Still, they keep trying because Libra is a sign that needs to be in a partnership to feel complete, and Libras are willing to put up with a lot in order to achieve this. However, if their relationships deteriorate to the point where fights occur regularly, Libras will quietly slide out of them, in some cases finding another partner before completely disengaging from the first one. This tendency has earned the sign a reputation for being fickle, but it actually results from an intense dislike of conflict combined with the need to be in a partnership at all times. Although they tend to avoid conflict in their personal lives, Libras are champions of the underdog and will stick up for others who are being treated unfairly in almost any situation. They won’t hesitate to speak up when they see an injustice done to anyone, even someone they don’t particularly like. Because they tend to be reasonable, nonjudgmental, and able to see both sides of an issue, Libras may be asked to intervene in disagreements between friends, family members, and coworkers. The downside to the ability to entertain multiple perspectives is that Libras tend to be very indecisive (unless their ascendants fall in more single-minded signs such as Aries, Taurus, Leo, Scorpio, or Capricorn). Libras can become so paralyzed by indecision that they are unable to take any course of action, which can make them appear wishy-washy or noncommittal to others. Libras have a love of luxury and personal aesthetics that can make them appear frivolous. Vanity may drive them to spend large amounts of money on items to improve their physical appearance or objects that are only for show. They usually keep their bodies, their clothing, and their homes very neat, and although Libras have a lazy streak, this almost never extends to personal grooming (it is very uncommon to find a Libra with unbrushed hair or wearing sloppy or dirty clothing). Libras tend to follow the trends of fashion, but only the ones that are elegant, classy, and have some staying power. Libra vanity makes this sign highly susceptible to flattery. Libras should be aware of this vulnerability because it can be exploited by unscrupulous individuals who want to take advantage of them. Most Libras are graceful, so they may develop talents for dance, skating, or other athletic pursuits that require kinetic intelligence. However, their energy levels tend to fluctuate, as though reflecting their inner need for balance. Thai chi, yoga, Pilates, and other mind-body arts are particularly beneficial for Libras, as they help to bring about the mental and physical balance they crave. The sun sign isn’t the only element that influences personality. Aspects and planetary placements, particularly the moon sign and rising sign (ascendant), are also important. For example, a Libra with Aries rising will be far more assertive, decisive, and combative than a typical Libra, and with Cancer rising, a Libra will be more sensitive and intuitive and less logical.